Steadily and perhaps quietly to some, Habitat for Humanity of Pinellas County has been changing lives for the past 34 years – one home at a time. At the nonprofit’s fifth annual signature fundraiser Blueprint held in April, CEO Mike Sutton shared news that the organization had been recently named second largest of the 1,300 member locations that comprise Habitat for Humanity International, a statistic that may surprise some but not Sutton. “We’re building 50 to 60 homes over the next 12 months which will include starting on our 500th home, a huge milestone for us that speaks to the support we continue to receive from the community,” he says. Kelly Wooten was another guest speaker at this year’s fundraiser and knows the impact of Habitat for Humanity of Pinellas County firsthand. 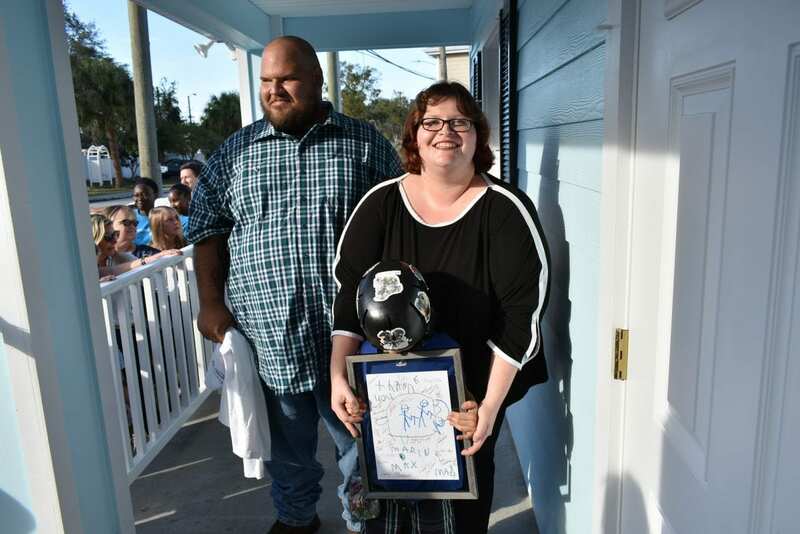 She and husband Nicholas and 7-year-old son Matthew moved into their new two-bedroom Clearwater home through the nonprofit’s homebuyer program, receiving the keys during a special dedication ceremony in February and officially moving in a month later. Habitat for Humanity Pinellas with CEO Mike Sutton go to work to help improve the lives of others as a hand up! For the Wooten family, the process of entering the homebuyer program and finally opening the door for the first time upon move-in took about five months, as the process pushed through some permit issues, a very active hurricane season and holiday breaks. After the hard work and 350 sweat equity hours invested in the construction of their home and others, Kelly Wooten says the family couldn’t be happier, enjoying the simple things that some may take for granted like quiet neighbors, reliable air conditioning, the convenience of having a dishwasher or washer and dryer onsite or even having one’s own “problems” to deal with like fighting weeds. These are problems Wooten loves tackling because as she puts it “these are our little problems we can solve.” For Wooten, home ownership has meant taking the reins of their lives, taking control, and that means everything. 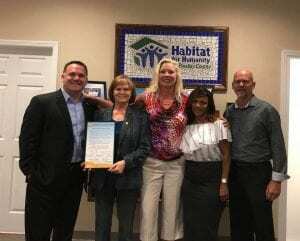 In addition to Habitat Pinellas’s home purchasing program, the organization also supports existing homeowners in the South St. Petersburg area with its St. Pete Midtown Home Repairs revitalization program. Sutton says the group partners with families to provide critical home repair services such as roof or HVAC system replacement, handicap accessibility or ramps, and other home improvements. “One of the things we realized is that home ownership there is generational, so families may own homes for generations and not have a clear title or struggle from paycheck to paycheck and the homes can fall into disrepair,” he says. “By improving the home, we help make it more sustainable for the long term.” The revitalization program supports on average about 15-20 critical home repairs per year in addition to another 20-40 homes which benefit from a subset of the program, A Brush with Kindness, providing external work for neighborhoods such as painting and landscaping. 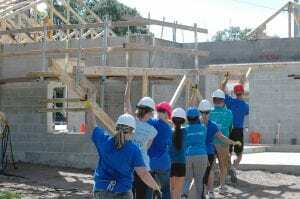 Sutton says that between all three programs – new home construction, critical home repair and Brush with Kindness – the organization serves about 125 to 150 families a year in Pinellas County. The community can lend its support for Habitat for Humanity of Pinellas County in any one of four ways currently in place. Individuals or businesses can get involved by volunteering individually or with their families or companies; by donating cash, goods for the annual gala or golf tournament or even donating property; by referring a potential individual or family to the homebuyer or revitalization program; and by shopping or donating at either of the organization’s two ReStore locations in Clearwater and Palm Harbor, where 100% of proceeds go back into building new Habitat homes. For now, the building continues toward that milestone 500th home in the not-so-distant future. Sutton says it’s not unusual for members of his team (he included) to shut down the office and work on a house together. He calls it a reminder of the work that’s being done by the nearly 7,000 volunteers each year that help keep the Habitat program running. Click here for a recent DESTINATION TAMPA BAY story about Habitat for Humanity of Pinellas County’s signature fundraiser event!